City of London EC Steam & Dry Rug & Carpet Cleaning Company | Quality Property Care Ltd. Call 020 3746 4287 and get in touch with our expert team. With a wide range of capabilities, we can ensure the finest rug and carpet cleaning in the entire City of London EC area. Check back with us often, every month we have special deals and offers which can save you up to 35% for your next cleaning payment. For more sensitive materials like silk and cotton we use a more gentle approach which does not rely on heat or moisture to remove a stain. Natural materials hardly ever react well to both moisture and heat so we are using a special dry compound which is in a granulated form. The same process of stain and carpet or rug prepping does apply as was explained in the hot water extraction method, allowing us to better remove the blemish. This time we pre-treat the stain with a special detergent, specially chosen for the sort of fiber we are cleaning. It’s put on and let to set into the spot. Once that is done we apply the granulated detergent and spread it using a fine brush. This imbeds it into the fabric of the material forcing it into the stain. The dry ingredient is also let to set for 10 mins after which we extract it using a high powered vacuum machine, eliminating 100% of the filth and detergent and filth. There is no trace left, leaving both your carpet and natural rugs fully spotless and cleaned. Go ahead and book your carpet cleaning services, right now, to ensure the air in your office or home is clean and safe and clean. Unlike standard synthetic carpets, rugs can be a challenging task, when it comes to proper and comprehensive sanitizing. 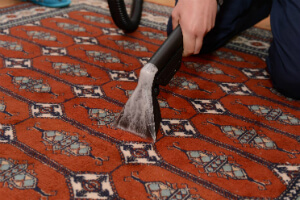 Our rug cleaning specialists, though, are well-trained to cope with all types of carpets and rugs: cotton, wool, synthetic, silk, sude, viscose, linen, chenille, plush, nubuck, leather and acrylic. Depending on the fabric type, the professional carpet cleaners in City of London EC chose the most suitable method. Attention: we always test the detergents on the backside of the rug to ensure it will not get wasted. Keep in mind that Quality Property Care Ltd. carpet cleaning company, though, performs only with tested and 100% biodegradable cleaning detergents with no chemical substances. Last, but not least, the carpet cleaning groups can also offer: Bed Bug Mattress Treatment Mattress Cleaning Drapery Cleaning Curtain Cleaning Blinds Cleaning. Bear in mind that if you purchase more than one service, we will make a special discount for you! Receive your offer now and don`t get worried about the cleanliness at home the next day! We would be glad to assist you! The first thing you have to do to reduce the stain reach and the possible damage, is to blot out the stain with a piece of cloth or paper. From edges in blot out the spot and check the paper or cloth or paper to see if it’s transferring. This will draw out most of the spot and leave just a small amount for us to remove which make our job easier and your carpet’s chances a lot better. Once we arrive we examin the carpet and determine which detergent will do the job. The carpet is cleaned with a hoover to remove any debris and get ready the fabric for cleaning. Once hoovered we implement the cleaning agent on the spot and let it stay for a while so it can react with the spot and help lift it up from the fibres. To remove it all we use a slim nozzle and our strong hot water extractor which blasts the area with a hot steam jet while simultaneously drawing all of the filth and gunk, as well as water, out with a solid vacuum. Nothing of the stain and detergent is left, with only about 5% of the moisture used to thoroughly clean left to evaporate naturally. Dependent on the day and thickness of your carpet, the process should take anywhere between 3-4 hours. Book anytime by calling 020 3746 4287 or posting a booking form on our web site. Get in touch with us with no hidden fees and any obligations.